Betfair Poker is found on the Betfair site, a huge betting exchange where you can also find sections for Casino, Live Casino, Bingo, and more. Just like may other poker rooms attached to sites that are chiefly known for their sports betting, Betfair Poker is a part of the iPoker Network. 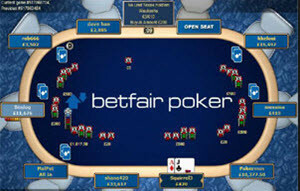 Betfair Poker use the iPoker Network poker software, so if you have played at any other poker room within this network you will recognize the basics. Examples of popular features are the quick seat option, auto top up, buddy list, and enhanced search function. You can play up to 15 tables simultaneously and use multi-table mini-view. The software is steady and reliable, but a little lacking when it comes to graphics and animations. A bit downside is that there is no downloadable client for OSX (Mac OS). The downloadable client only works with Windows. Apple device users mus resort to playing the browser instead, or use a Windows emulator. When you play fast poker, you are moved to a new table as soon as you discard your cards. This makes the game much faster for you, since you no longer have to waste any time waiting around for other players to finish a hand that you are no longer a part of. The fast poker variant offered by iPoker is called Speed Hold’em Poker. Betfair Poker is a part of the iPoker network, so as a member of Betfair Poker you gain access to all the iPoker tournaments, both MTT:s and Sit & Go’s. There is a nice selection of freerolls and micro stake tournaments available, as well as more pricy options. If you are looking for tournaments with big guaranteed price pots, we can recommend the $200k GTD that is played every Sunday. The Twister Sit ‘n Go tournaments are turbo S&G’ where the entire price pot goes to one winner. The size of the price is decided randomly, but is always at least twice the buy-in. The largest price pots consists of 1,000 times the buy-in, so if you win after buying in for $10 you get $10,000! Betfair Poker have travel packages to give away to large offline poker events such as World Series of Poker (WSOP), World Poker Tour (WPT) and European Poker Tour (EPT). Buy-in directly to a qualifier where there is at least one travel package guaranteed in the price pot, or start in one of the cheaper satellite tournaments and work your way up. As as offline poker goes, we also want to point out that Betfair is running Betfair Poker Live. 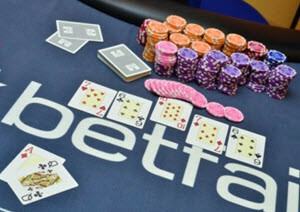 Befair Poker Live is a live tournament series for European destinations. 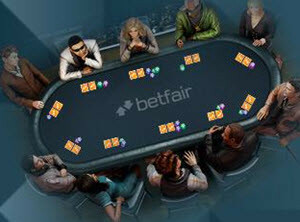 Betfair Poker is a part of the iPoker network. When it comes to traffic to cash game tables, iPoker is close to the top but not as heavily visited as PokerStars, 888 Poker or Bodog. As expected, the games are loose at micro and low stake tables and tournaments, and become tighter as you go up. Generally speaking though, you can find quite a lot of loose as well as passive players at the tables even at mid-stakes. Since a lot of the poker rooms included in the iPoker network are attached to sites that primarily cater to sports bettors, iPoker gets a lot of spill over traffic in the form of novice poker players – and quite often they have a betting win to burn. You get a 100% bonus on your firs deposit, up to a maximum of €1,000. You have 90 days to release your bonus. If you arrive from certain affiliates, you will instead get 100% bonus up to €1,500. When you have played your first real-money ranked hand or real-money tournament on Betfair Poker, you will get a ticket to a $2,500 Welcome Freeroll. The Betfair Poker recruitment bonus is €25. You gather loyalty points by playing real-money poker. When you have enough loyalty points, you can trade them in for cash. There is an VIP Club with 10 levels. The higher you climb, the better the perks. All VIP members have access to a monthly $5,000 VIP Freeroll. English speaking support staff is available 24/7. You can call or send an email. The email address is pokerinfo@betfair.com. The phone number to UK is 0044 203 059 8888. Betfair Poker is owned by The Sporting Exchange Ltd, which is a subsidiary of the huge Betfair Group PLC. It is headquartered in London, with additional offices in Malta, Gibraltar, Romania, Ireland, and the USA. Betfair was listed on the London Stock Exchange on 22 October 2010, after being in business for roughly a decade. Betfair’s betting exchange is one of the largest betting exchanges in the world, with a weekly turnover exceeding £50 million.